Ever wanted to grab a quick snapshot of who’s searching for what out there? 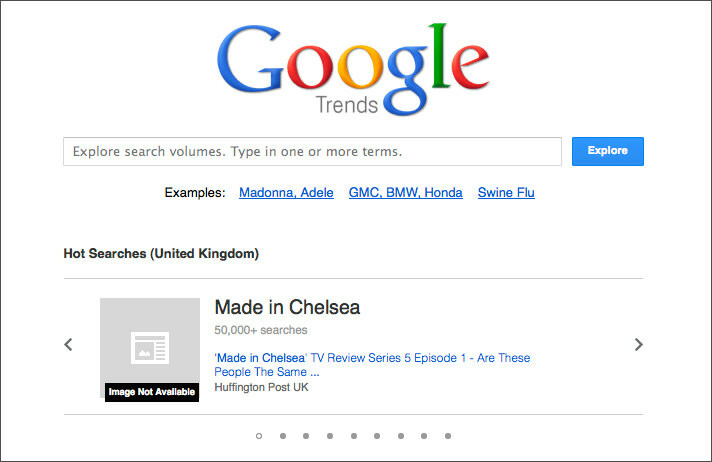 Well now you can with a neat little tool called [Google Trends], which will give you instant search-word trend analysis, plus some useful comparison options too. It won’t do the work of a [Search Engine Optimisation – SEO] programme, but it is a great way of keeping up with trending interests online and can be useful to businesses looking to keep tabs on some of the strongest product and/or service search terms currently being used. Google’s [Inside Search] blog tells us that since launching it at the end of 2012 they’re steadily making improvements over time, such as making the interface much clearer and easier to use. But beware… there is a quota limit at the moment, so use sparingly! And to find out the best ways of including the [Google Trends] analysis into your website design and development project take simply a look at our [Internet Marketing & SEO] page – then call 01603 622500, or email [email protected] for more information (and we’ll get our SEO guru Kris to give you a call back as soon as possible).